A fresh and juicy breeze of galbanum and orange slowly reveals a floral green heart supported by precious woods. A very long time ago, roses grew without thorns. Their beautiful blooms didn't always come with the menacing daggers; nor did they entice with their beauty only to wound with their armor. The story goes that their thorns were created after a fairy that lived among their blooms refused to grow up. The fairy was light and nimble and would spend her days dozing and relaxing in the petals of the roses. It is said when fairies come of age, they must leave the safety of the petals and fly to the forest to grow old. However, this fairy we speak of was in no mind to leave, and the furthest she'd venture was down the stems to the puddles of water below. Fed up with the fairy, now growing and getting heavier, the flowers convened and decided something must be done. One day when the fairy was paddling in the cool pools of water collected after a brief sun shower, the roses grew thorns all the way up their stems, preventing the fairy from returning to their petals. The fairy was forced into the forest, leaving the stems of the flowers armored and prickly. Inspired by the memory of his grandmother, Sheikh Majed Al-Sabah founded TFK (The Fragrance Kitchen) in 2005. The Kuwait-based fragrance house offers the ultimate in evocative luxury, through the use of Oud, Taif Rose, and burning Argarwood. 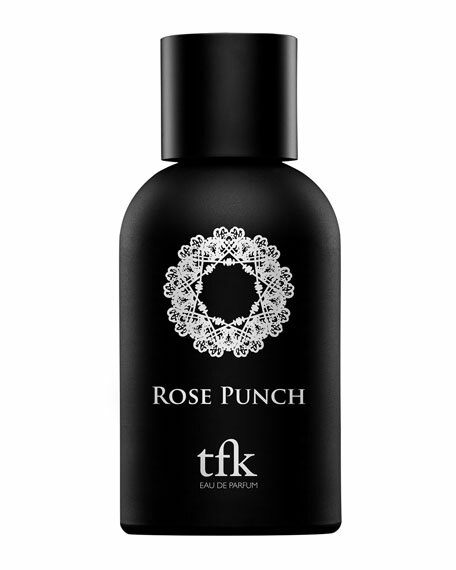 Long after you leave a room, the scent of your perfume lingerscreate sensorial memories with TFK. For in-store inquiries, use sku #1785860.